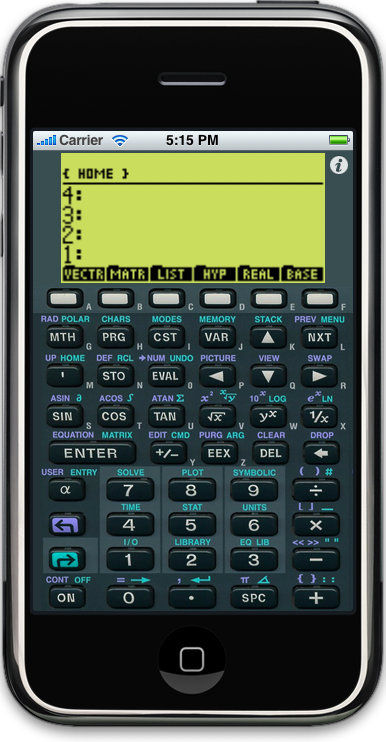 i48 is an emulator for the HP48GX calculator, so the next time you’re out and about and need to do some quick matrix calculations or work out the integral of a function, just whip out your iPhone (or iPod touch) and have at it. i48 is based on the x48 project and as such is open source. The source can be accessed via github here. Great start! I hope to see a help system and a way to import objects in the future. A suggestion to save space: if we touch the soft menu labels directly the white menu keys are not needed, small labels ‘A’ to ‘F’. We could use the extra space to draw the keys bigger. Wow! I have been waiting for a HP-48 series emulator since I bought my iPod Touch last year. I have a number of other HP calculator emulators for the iPhone/iPod Touch but I use my HP-48SX almost daily and it is my favorite. I don’t know if you are permitted to sell a version of this open source emulator but I would gladly pay $15-$20 for a version that offered saving and loading programs via WiFi. Thank you very much for porting this emulator!!! Thanks *so* much for putting this out there… the 48 was my buddy, and it’s been hard trying to get used to the other excellent apps out there that simulate older machines. I would suggest enhancements such as keyclicks and animation like the 42s program uses, which does a great job of replicating the feel of a physical calculator. I too would be eager to pay good money for this app, particularly with such enhancements, and perhaps a program-transfer feature, again like the 42s did so well. I would be happy to compensate the fine efforts made to port such open source software to the iphone, and get it placed on the app store. Thanks a bunch, and great job! Great job. Back in the early 90s I used a 48sx thru high school… then the 48gx at the university. I still have both of them but prefer the software versions such as Emu48 on Windows and Power48 on the Palm. – could you get rid of the interpolation on the screen. The blurry look is really painful after a while. – the first step before going to clickable button would be to use a drawn keyboard instead of a skewed pictutre. In case the comment system drops the link, I included the link in my “website”, so click on my name left of the comment. I really like the latest mock up, particularly the lining up of the buttons under the folders on the screen. Thank you very much Fabrice!!! Just one suggestion… could add an option to select/emulate the Hp48Sx instead of the Hp48Gx? Really thank you again: this was one reason to buy the iPhone, even if a Hp48 still didn’t exist at the time. Excuse me! I meant to say Daniel instead of Fabrice… but thanks anyway to Fabrice for the “mockup” image. I just hope you got the full rez picture. Because I remembered that PBase displays scaled down images by default. So unless you click on the Original link at the bottom of the page… you got a imperfect JPG. Yes, I got the original file and it looks pretty nice in the app. Maybe if I get some time later I’ll post a screen shot to my blog. Hat’s off to you for getting this through! The latest code in git has this. I’m currently looking into supporting sound, but it looks pretty nasty to get 100% emulation of the sound due to the way the HP48 produces sound. I may submit the current code in the next few days and then see about adding in sound for a third release. Other than the above, I think i48 is an excellent app and will be my iPhone calculator of choice from now on! Thanks so much for putting this together. I only have one request / suggestion. Someone had previously ported the 48 to both pocket PC and Palm devices. Each of these had a rather nice / intuitive landscape skin / key configuration. Any chance we could see something similar in future updates? I have an ipod touch 2g with the 2.2.1 firmware (downgraded from 3.1.1,), I had the i48 v1.0 but I updated to the 1.1 one and It doesn’t work any more on the 2.2.1 firmware, where i can get the 1.0 version?? After 13 years of owning a 48GX i was positive, “there is nothing else out there”. But i was wrong! There is. 48GX on your iphone of course. Guys you rock! keep it up! I loved your 48 emulator for the PalmOS! Any there any way I can get it for WebOS! It doesn’t work via MotionApps’s Classic. I’d be happy to have it on my Pre Plus any way possible! I am User I48 emulator, and after updating the IOS5 realized tha the emulator is not working properly on my IPOD. Already reinstalled over the error persists. In general the error and he has not run the command, like clear the screen, enter the number. Thank u for this wonderful app but PLEASE :,-) create the wide screen for IPad ! there is a bug in the theme selection code on the iPad version that I have not had a chance to look into. To fix the problem you need to go to the i48 settings page and choose a new theme. This only happens if you have had the iPhone version of i48 installed on your iPad. It will be great if you can resize the screen for the new iPad 3! You are able to use the app, but once you close and move on to another task, it is dead for life. When you try to reopen the app, it does nothing, but show you the image of the 48GX (no funcionality). The only fix, is to re-install it every time, which is a pain. @BJR – There is an option to reset the emulation in the i48 section of the iOS system settings app. This should allow you to get back up and running. Which version of iOS are you running on your iPad? I tried reset emulation but no change. I’m using version 1.4 and had added programming (equations/variables/units/etc.) and saved the RAM & ROM files to my hard drive. Well the app crashed & I couldn’t get it to respond so I deleted it. Is there a way to restore the programming from the RAM and/or ROM files I saved? WOW! That was a quick reply. Thanks for that. At least you confirmed that restoring my stuff was possible. I had tried the method you described but it didn’t work. I kept on tinkering until the following worked. 1. Delete app from phone & sync. 2. Re-install app from itunes & click apply. 3. Add files saved on hard drive and sync yet again. 4. Only then open the app on the iphone. Then all my stuff was back! I try to reply as quickly as possible. What you should have been able to do is make sure that i48 is not running, then use iTunes to delete the files, and then replace them with the saved ones. Then starting i48 should just work. The main thing is to ensure that i48 is not running when you replace the state files. You could also try using the “reset” option in the i48 section of the system preferences app. That was my mistake then – I didn’t make sure it wasn’t running. Hello Daniel, I don’t know if you are willing to, but I am looking for some time for an emulator of the HP 48 for Symbian S60V5 (to my old but good Nokia 5800) and anything I found are for really old that doesn’t work today…and finally I found you blog which is really active. So, as Symbian also is programmed in C (in case C++) what would you think about in compile your code to a Symbian mobile? I imagine the core of the code could be compiled for Symbian, but it would require a totally new UI to be written. I don’t have access to any Symbian devices any more, so that would be a bit of a problem. I wouldn’t imagine you would answer me so fast!! Daniel, I downloaded and installed the Carbide C++, which have an emulator (http://developer.nokia.com/info/sw.nokia.com/id/dbb8841d-832c-43a6-be13-f78119a2b4cb.html) and the Nokia SDK (in case S60 version) and tried to add the source code I got at X48 sourceforge to the “Hello World” code but (of course) it didn’t compile. As my knowledge of C++ is close to nothing and knowing that IOS uses Objective C which I suppose (I am assuming here) is close to C++, I was thinking it would be easier to compile it for someone that knows the the language and the calculator itself. I am getting into some tutorials of C++ but I don’t know how long it will take to make it by myself! Well, perhaps you can take this as a challenge…is up to you! Anyway thanks for your attention to this! feel free to email me directly with questions about the code. Objective-C and C++ have totally different ideas about object orientation. On the surface they are similar, but the main difference is in C++ you call methods, whereas on Objective-C you send messages. It is a subtle distinction, but an important one. You may be able to use some of the concepts that I have used to get something running under Symbian, but none of the the Objective-C code will work for you. It is a great application but please fix it after the new update of the iOS recently launched. I’m running it fine under 9.3.3. What sort of problem are you seeing?